When I told people that we were going to run our infrastructure on Amazon’s EC2 most people recoiled in disgust. I heard lots and lots of horror stories about how you simply couldn’t run production environments on EC2. Disk IO was horrible, throughput was bad, etc. Someone should seriously tell Amazon, since a lot of their own infrastructure runs in EC2 and AWS. For the most part, Amazon’s AWS were internal tools that they released publicly. We’ve been ironing out kinks in our production environment for the last few weeks and one of the things that worried me was if these assertions were true. So, I set out to run a fairly comprehensive test of Disk IO and throughput. I ran hdparm -t, bonnie++, and iozone against ephemeral drives in various configurations along with EBS volumes in various configurations. For all of my tests I tested the regular ephemeral drives as they were installed (“Normal”), LVM in a JBOD setup (“LVM”), the two ephemeral drives in a software RAID0 setup (“RAID0”), a single 100GB EBS volume (“EBS”), and two 100GB EBS volumes in a software RAID0 setup (“EBS RAID0”). All of the tests were ran on large instances (m1.large). All tests were ran using the XFS file system. While hdparm -t isn’t the most comprehensive test in the world, I think it’s a decent gut check for simple throughput. To give a little context, I remember Digg’s production servers, depending on setup, ranging from 180MB/sec. to 340MB/sec. I’m guessing if you upgraded to the XL instance type and did a RAID0 across the four drives it has you’d see even better numbers with the RAID0 ephemeral drives. What I also found pretty interesting about these numbers is that the EBS volumes stacked up “okay” against the ephemeral drives and that the EBS volumes in a RAID0 didn’t gain us a ton of throughput. Considering that the EBS volumes run over the network, which I assume is gigabit ethernet, 94MB/sec. is pretty much saturating that network connection and, to say the least, impressive given the circumstances. For most applications, I’d guess that EBS throughput is just fine. The raw throughput only becomes a serious requirement when you’re moving around lots of large files. Most applications move around lots of small files, which I’d likely use S3 for anyways. If your application needs to move around lots of large files I’d consider using a RAID0 ephemeral drive setup with redundancy (e.g. 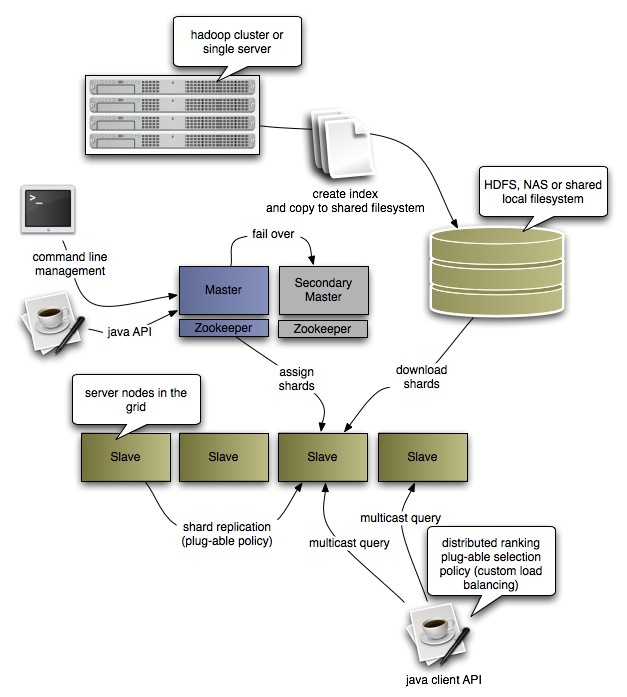 MogileFS spreading files across many nodes in various data centers). 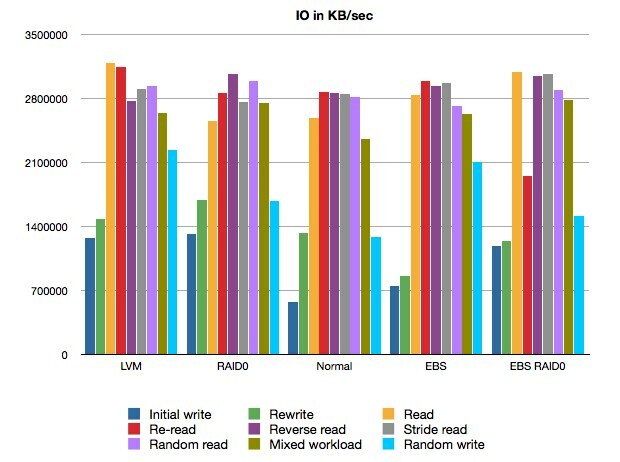 Disregarding the Input/Output Block performance of the ephemeral RAID0 setup here, it’s extremely interesting to note that EBS IO performance is better than the ephemeral drives and that EBS in a RAID0 was better in almost every metric as the ephemeral drives. That all being said, RAID0 ephemeral drives are the clear winner here. I do wonder, however, if you could set up a RAID0 EBS array that had, say, four or six or eight volumes that’d be faster than the RAID0 setup. If your application is IO bound then I’d probably recommend using EBS volumes if you can afford it. Otherwise, I’d use RAID0. Again, the trick with the ephemeral drives is to ensure your data is replicated across multiple nodes. Of course, this is cloud computing we’re talking about, so you should be doing that anyways. Here’s the CPU numbers of the various configurations. One thing to note here is that EBS, LVM, and software RAID all come with CPU costs. 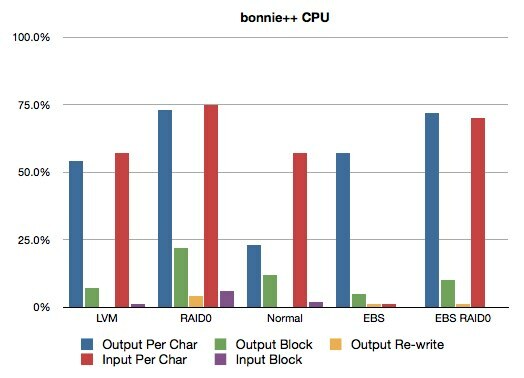 Somewhat interesting to note is that the EBS has substantially less CPU usage in all areas except Input/Output Per Char. If your application is both CPU and IO bound then I’d probably recommend upgrading your instance to an XL. 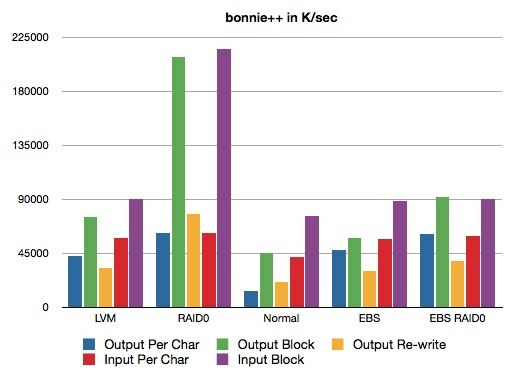 The last bonnie++ results are the random seeks per second and, wow, was I surprised. 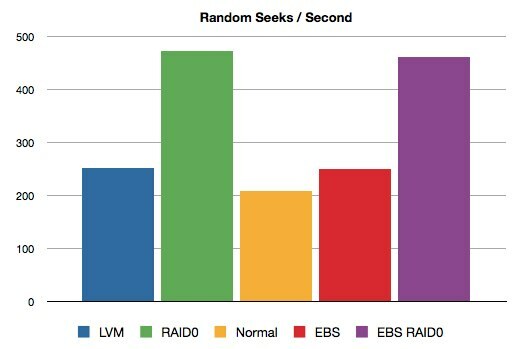 A single EBS runs pretty much dead even with the LVM JBOD and the EBS RAID0 is on par with the RAID0 ephemeral drives. To say I was surprised by these numbers would be an understatement. The lesson here is that, if your application does lots of random seeking, you’ll want to use either EBS RAID0 volumes or RAID0 ephemeral drives. Before running these tests I’d never even heard of this application, but it seemed to be used by quite a few folks so I thought I’d give it a shot. Again, some interesting numbers from EBS volumes. What I found pretty interesting here is that the EBS RAID0 setups actually ended up being slower in a few metrics than a single EBS volume. No idea why that may be. The other thing to note is that the single EBS volume outperformed the ephemeral RAID0 setup in a few different metrics, most notably being random writes. 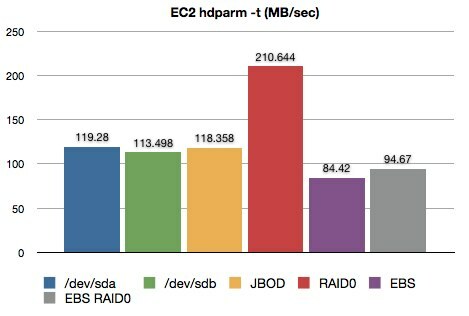 I think the overall conclusion here is that disk IO and throughput on EC2 is pretty darn good. I have a few other conclusions as well. If you can replicate your data across multiple nodes then the RAID0 ephemeral drives are the clear winners. If you are just looking to store lots of small files and serve them up, then definitely use S3 with CloudFront. You’d very likely get even more impressive numbers using the XL instances with RAID0 striped across four ephemeral drives. Another potential disk setup would be to put different datasets on different ephemeral drives. For instance, put one MySQL database on one ephemeral drive and your other one on another. If your setups are IO bound and you’re looking for lots of redundancy, then EBS volumes are likely the way to go. If you don’t need the super redundancy on a single box then use RAID0 on ephemeral drives. The more exciting part, I think, though is the design. It’s been in my head for years, but never could figure a way to convert itself into bits and bytes. Thankfully, the highly skilled Jake Mix was able to take care of the gorgeous illustrations. Once I had the illustrations in hand, I had the young protégé Julian Targowski put the various bits together into the amazing design you see now. There are still a few bits and bytes that are not aligned properly and I’m 99% sure that the site is totally broken in Internet Explorer (a fact I care little about). If you like what you see I highly recommend contacting Jake and/or Julian. SimpleGeo (formerly CrashCorp) is hiring! Things are really starting to get crazy at SimpleGeo (formerly CrashCorp), the company I founded with Matt Galligan in June. We’ve been running around like crazy meeting with partners, building the platform, raising money and having a ton of fun. The good news is we’re hiring! If you’re a Python, infrastructure, scaling, GIS, LBS, systems nerd who loves building massive infrastructure we’ve got some jobs that might interest you. Infrastructure Engineer – Experience with distributed systems, EC2, Python, non-relational storage engines, Django, etc. LBS/GIS Guru – In depth knowledge of LBS/GIS and the algorithms, technology, data, and systems surrounding the field. If you or anyone you know would be interested in either of these jobs please contact me via email at joe at simplegeo dot com. Must be local to Boulder or willing to relocate. It’s taken a long time to get here, but the first version of Chess Wars is live in the App Store. It’s a bit awkward, but the general story is that Crash Corp was started to make these games, but switched gears when Matt Galligan and I teamed up to seek funding for other, more interesting, games. As a result, Blunder Move was born. No signup process. Simply log in with your Facebook account using Facebook Connect. Play against your Facebook friends! Send challenges and invite your friends to play against you. Works over WiFi, EDGE, or 3G. Play using your iPhone or iPod Touch. A little rusty at Chess? Don’t worry it highlights potential moves when you select a piece. Play and keep track of dozens of games with our simple inbox. Games are organized by game state (e.g. My Turn, Their Turn, New Challenges, etc.). Our in-game chat system allows you to taunt your friends easily. Everyone loves rubbing a good move in! Get notified on Facebook when a friend makes a move or sends you a chat message. Scroll back through move history easily. If you have any questions please don’t hesitate to contact us with your issues. We’ve got a lot of plans for next versions and will be releasing checkers and reversi next. The short story is it’s not possible to change your artist name in iTunes Connect. The longer story is that, when you sign up for an iPhone developer account, you enter in your artist name and, likely, forget all about it. That is, until your app goes live in the App Store and you notice “I dunno” is what your app is listed under. What makes this so frustrating is that there is absolutely no way to find out what your artist name is. It’s not shown in any of the certificates nor it’s not shown in iTunes Connect. Sure, your copyright holder, company name, etc. are all viewable, but that very important artist name, which your application actually gets listed under? Nope. Luckily, I didn’t have to contact Apple through normal channels, which I hear takes 4 – 6 weeks to get a change done, but I did find plenty of things to be annoyed about. You cannot preview your application in the App Store without actually publishing it into the App Store. Your artist name is not listed anywhere in iTunes Connect so you cannot verify any changes. You cannot view the status of a case number anywhere. You have no way of passively viewing the status of your case. You have to email them to find out if it’s closed or not. The list of your applications in iTunes Connect should be switched to look exactly like they would be listed in iTunes. In the applications overview it should show the artist name (even if I’m not allowed to edit it I should at least be able to see it). Allow me to see a simple overview of any pending cases I have. Just something like a case number, when it was opened, and status (e.g. “In Review”, “Not Assigned”, “Waiting on Developer”, “Closed”). Add this to the long list of things Apple should fix in iTunes Connect and the App Store for developers.